If you've been following me for awhile now, you know ALL about this recipe because it's one of our favorites! It's the recipe I get the most questions about so I thought it was time for me to post it on here for y'all. Plus it's SO EASY and kids love this stuff. So here we go! In a bowl, toss together veggies with olive oil and sea salt (or seasoning of choice). Throw on a sheet pan with the sausage and roast in the oven (middle rack) for 10 minutes. Take out and flip veggies/sausage. Put back into the oven for another 5 minutes or until it reaches your desired level of crispness. We make this recipe once a week! 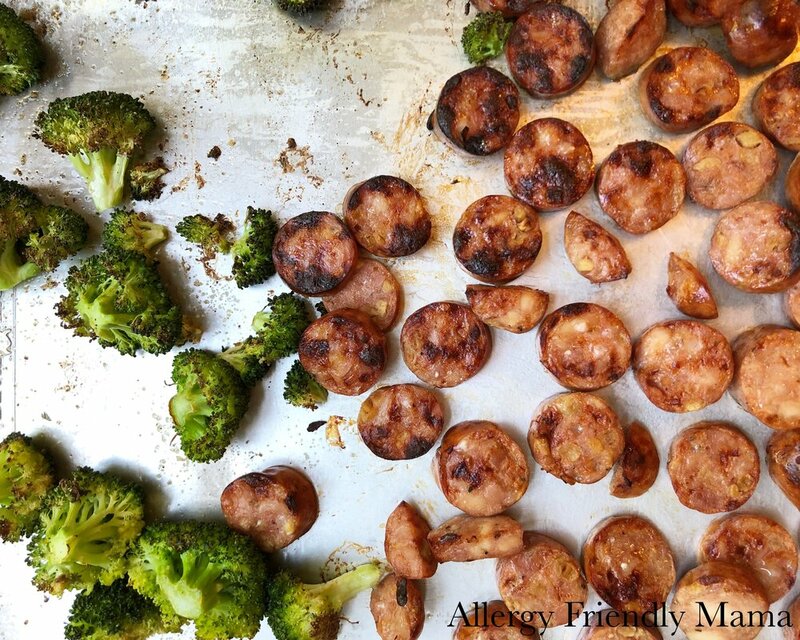 I love this particular brand of sausage not only because it's allergy-friendly, but because it's precooked, stinkin' delicious AND you can store it for WEEKS in your fridge as long as it stays in the sealed bag. It's the best and you really can't go wrong with this recipe!